Many off-road clubs are moving toward using amateur (or ham) radios for trail communications because of the range limitations of CB radio, especially in mountainous areas. With the right equipment and knowledge, an amateur radio can also allow you to radio for help if you are stranded in a remote area with no cell phone signal. You do need to be licensed by the FCC to operate an amateur radio, but the entry level Technician exam isn’t very difficult. You can take a class or purchase a study guide. I used the ARRL’s Ham Radio License Manual to study for the exam and took the online practice tests at QRZ.com until I felt ready to take the exam. It cost me $15 to sit for the test, and the license is good for 10 years. Depending on your needs and wants, a handheld (HT) radio can be purchased for as little as $40. Add a good antenna mounted on your vehicle, and you can have a basic setup for less than $100 to get you started. If you spend a lot of time in remote areas, you’ll probably want to eventually upgrade to a General license and a more powerful HF radio for your vehicle. Some radios are also capable of APRS (Automatic Packet Reporting System), which can use an internal or external GPS to allow people to track you on a map and can also be used to send digital messages — similar to how a SPOT Messenger works but without requiring a subscription plan. Even if you have a dual deep cycle battery set up and inverter in your vehicle, it’s not wise to rely solely on your vehicle for recharging your electronics. When the vehicle is running it is the alternator that actually supplies the electrical energy, but when the engine isn’t running the power comes directly from the battery. If you run out of gas or have a mechanical breakdown and can’t run the engine, you don’t want to risk running down your vehicle’s battery. Solar is ideal for any off-road adventure, but it is key in an emergency situation. Determining the proper solar system for your needs requires a lot of math and can get quite technical, but Goal Zero makes it easy. You can even contact them directly to discuss your requirements and they will help you choose the right kit. Their products are specifically designed for active outdoor lifestyles and are perfect for off roaders because they are lightweight, portable and weather resistant. Since I spend days at a time working off the grid I needed something that would allow me to charge several electronic devices, including a cell phone, gps, ham radio, camera batteries, lights and a laptop or tablet. The Goal Zero Yeti 150 Solar Generator Kit with a Nomad 20 Solar Panel is the perfect combination of power and portability for my needs. With 150 watt hours of power to supply to devices via the two USB ports, a 12V port and an AC inverter, I have plenty of power to keep all of my devices charged. The AC inverter in the Yeti is important because some electronics, like my camera batteries, can only be charged using a wall plug. My ham radio is charged via a wall plug or the cigarette lighter in my Jeep, so if my Jeep isn’t running, the AC inverter or 12V port in the Yeti is essential if I plan to use my radio for emergency communications. The Nomad 20 Solar Panel will fully charge the Yeti 150 in 17-34 hours depending on weather conditions. I have charged multiple devices at the same time for several hours using the Yeti 150 with the Nomad 20 in full sun, and the battery remained at full charge. If your needs are greater, and you want to be able to charge the Yeti faster, multiple solar panels can be chained together. The Yeti 150 generator is kept fully charged between trips with a wall plug and can also be charged with your vehicle’s 12V accessory charger. Overcharge protection is built into the battery, and it is recommended to always be plugged in when not being used in the field. If you don’t need the AC inverter and only want to be able to charge small devices via USB, they can be charged directly from the Nomad 20 or any of the smaller solar panels. The Nomad 7 panel is only 9 inches on the longest side when folded and has both USB and 12V ports for charging small devices. Even though you may only be planning a short day trip, it's important to bring more food and water than needed in case something goes wrong. Water is my personal obsession; I once found myself on a 7-mile hike — with temperatures 20 degrees hotter than forecasted — when the bladder of my hydration pak sprang a leak. With my water source being depleted, I had a very unpleasant experience dealing with dehydration and heat exhaustion that I never want to go through again! So always pack more than you anticipate needing in case you get stuck out longer than expected or come across someone else who didn't plan well enough. I always pack enough water for at least one more day than I plan to be out. The human body can only last three to five days without water — fewer in extreme heat. You can’t carry too much water. Adding to extra water, it's a good idea to also carry a means to purify water. Although actually finding water will be challenging during this extended drought we’ve been experiencing in the West, filtering out any harmful bacteria is a must if using a natural water source. There are many small, portable options designed for backpackers that don’t take up much room as you can see in the examples above. A LifeStraw is small enough to tuck into your glove compartment. As with water, good emergency planning requires carrying more food than you anticipate needing. While the human body can last about three weeks without food, it wouldn’t be very pleasant, and it’s important to keep your energy level up when in a survival situation. There are many options that won’t take up much room in your Jeep: dehydrated meals, MREs, energy bars and goos/chews/blocks packed with carbs and electrolytes. You might not think to bring a flashlight if you are just going out on a day run with friends, but you’ll be glad to have one if you get stuck overnight. This Olight S10 Baton has become my new favorite because it's less than 3 inches long and even fits in a woman’s pocket. It packs 400 lumens in a hard-anodized aircraft grade aluminum housing, has four brightness modes plus a strobe mode, a magnet on the tail cap, a pocket clip and a lanyard — making it the perfect light to keep with you all the time. Nobody wants to carry a bulky tent or sleeping bag on a day run, but if you break down and are forced to spend the night outdoors, having some type of shelter could save your life. 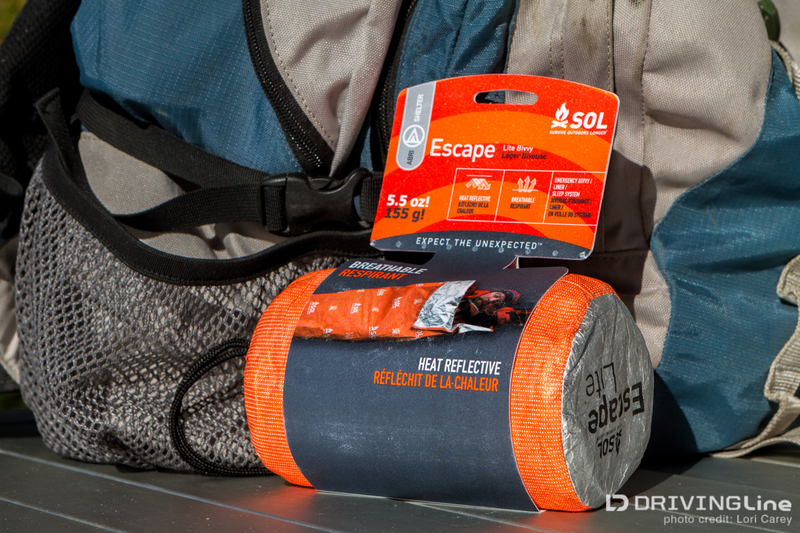 The SOL (Survive Outdoors Longer) Escape Lite Bivvy is about the size of a burrito and can easily be tucked under your seat or in a backpack. It’s breathable, highly weather resistant and reflects 70 percent of your body heat. It can also be used as a sleeping bag liner to provide more warmth. Always carry something to light a fire with. Waterproof matches, bic lighters and magnesium fire starters are all good, small options. The magnesium fire starter is one of the most compact and longest lasting; just be sure that you learn how to use it before a time comes when you need it. When out on the trail and needing to make repairs, having extra bungee cords, ratchet straps, zip ties and duct tape can come in amazingly handy. Even MacGyver needed these items from time to time! I hope this series has given you some good things to think about when planning for off road emergency situations, but I know there are many more items to consider. If you missed it, make sure you check out the rest of our off-road emergency tips in Part 1 of this series.